TAGSExplorer is an interface to TAGS based Google Spreadsheets of archived tweets. This data is analysed and the conversations between people are extracted and appear as connections. The more conversations a person has with other people increases the size of their screen name. Clicking on a node lets you see the summary of tweets, @replies and @mentions that person made. The displayed tweets are integrated into the Twitter service allowing you to Favour, Retweet and Reply to individual messages. From the summary window you can ‘Replay Tweets’ which lets you see the conversations that person had condensed into 30 seconds. Connections between people are separately identified as Retweets (dashed blue line), @reply (solid black line) and @mention (dashed black line). 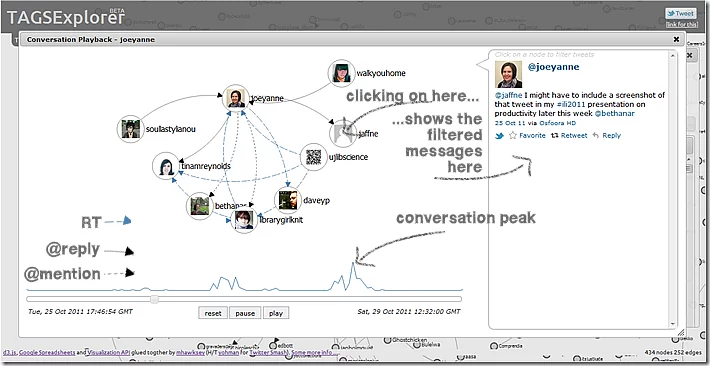 The conversation playback also indicates peaks in a persons Twitter activity. During the playback you can filter conversations by clicking on a node. This will display only the tweets that @replies, @mentions or retweets. It's possible to filter the data displayed using the Google Visualization API Query Language. Read this post for more information on usage.